Many electrical fires can be prevented simply by making sure that appropriate bulbs are used for lighting. Usage of bulbs that have too many watts for a light fixture can lead to overheating and fire. The New York City Fire Department also recommends that elderly people or their caregiver make sure that electrical cords are not damaged and prevent overloading. Plugging too many appliances into the same outlet can lead to fires as well. Outlets and switch plates should always be in good condition. Electrical appliances that are not safe such as defective coffee makers and toasters should not be used. 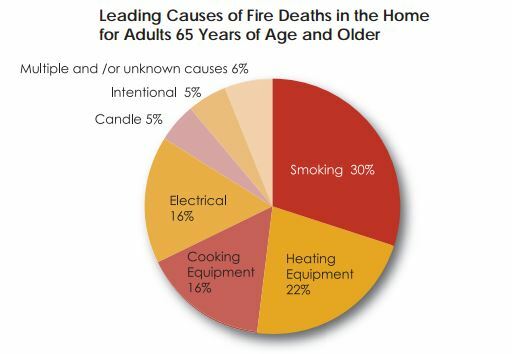 Space heaters and electric blankets are also a major cause of seniors apartment fires. The FDNY recommends to always position heaters at least 3 feet away from any flammable item. As for electric blankets the best away to avoid a dangerous fire accident is to heat the bed and unplug the blanket before going to bed. When cooking, it is recommended to avoid wearing clothes with long loose sleeves and always stand by the pans. Most kitchen fires start when the cooking food is left unattended.